Sometimes if you’re in love with it enough, a simple hobby can turn into raw passion. Take it from Louise Tan, a Collingwood senior, whose talented abilities come from her passion for art. For a very long time, Louise has been interested in art. This interest manifested itself into reality, and as all good things do, it took off from there. 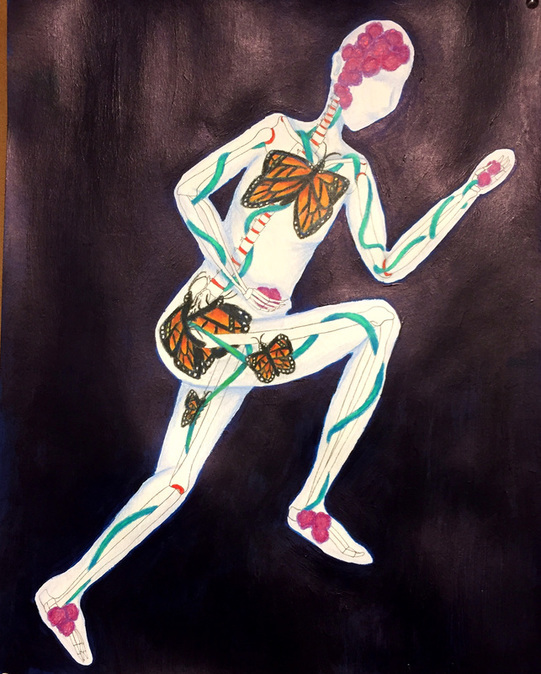 The focus of her art, the human body, intersects with her interests in medicine. Her work explores the human body and its physiology and biology. She prefers to work with acrylics for paintings, pencil colours, and digital designs. Picasso is one of the artists who inspire her, with his expressive paintings and the free, uncaring manner in which he paints. Now, in today’s digital landscape, artists have found social media websites such as Instagram or Facebook to be extremely helpful in building an audience. When asked about her opinions on the manner in which social media has exploded platforms for different styles of art, Louise replied that she thought the platforms were great, as, in her own words, “People can look at any type of work they like, and people can all get recognized.” One of Louise’s upcoming projects to look forward to is her AP 2D design concentration in which she will showcase the connection between the different body systems and machines. After graduating from high school next June, she plans to go to university for medical school and take art classes on the side, combining the best of both worlds. 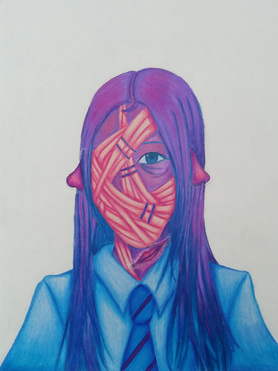 ​Comment on photo of the girl in a uniform and a face with no skin: "This artwork represents a person who cannot see the true world because of others’ overprotection. Her face is covered to prevent her from experiencing the real world with her own mind. The feelings she experiences is only partial and twisted with others’ lies, since she only has one eye with which she can see and noses that have replaced the function of her ears. She is isolated from reality and can only examine the world without any emotion, since she has never learned such sensations. The protection exerted from others turned out to only be a burden." (Taken from Louise's Collingwood art blog with permission).